If you’ve ever slipped on a sidewalk covered in a coat of ice, you’ve experienced an effect of freezing rain firsthand. Freezing rain can turn everyday activities, like driving, into dangerous activities. In fact, the glaze that is formed from freezing rain is notorious for causing problems from slowing or stopping traffic on roadways in the winter months to taking down power lines. Freezing rain starts its journey in the atmosphere as snow. The snow encounters a deep pocket of warm air, melts and becomes rain. The rain then passes through a layer of air close to the surface where the droplets cool to a temperature to just below freezing; however, the droplets don’t actually freeze over. When the “supercooled” raindrops hit the surface, like a road, tree or power line, they immediately freeze and form a thin glaze of ice. Freezing rain can lead to slick roads and sidewalks, causing drivers and pedestrians to skid and slide. For pedestrians, freezing rain glazing the ground can lead to minor to moderate injuries from falling. In the case of freezing rain on roadways, however, ice can be particularly hazardous to drivers. It can lead to drivers losing control of their vehicles and causing car accidents. In particular, bridges and overpasses require careful navigation during a wet cold snap because they typically freeze more quickly than other surfaces. An accumulation of ice is not only slick but heavy. 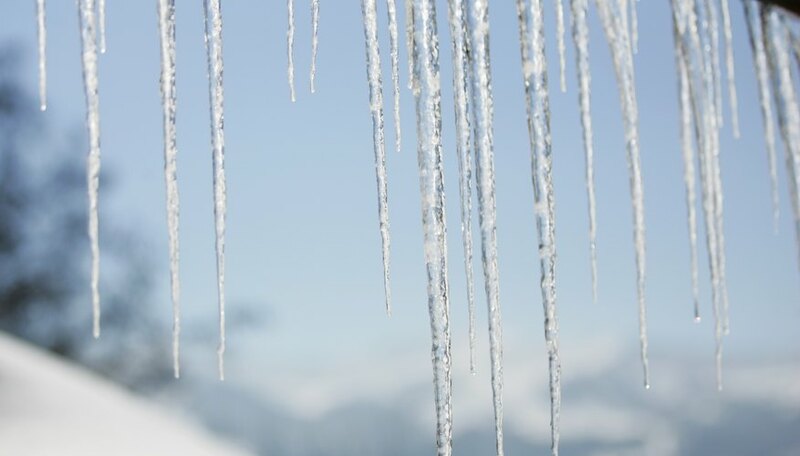 An extra half-inch of ice covering a power line can add up to 500 pounds of weight. Trees also experience a heavier load, causing weak or overloaded branches to fall. Between falling tree limbs and the extra weight on power lines, power outages can occur when freezing rain falls. Thousands of people in the affected area can be left without electricity for several hours to several days. In fact, in April 2013, more than 300 power poles toppled under the weight of accumulated freezing rain in Ontario, leaving more than 150,000 people without power or heat, in some cases up to 24 hours. Freezing rain is extremely dangerous when flying in an airplane. The buildup of ice can change the shape of the aircraft, affecting lift, drag and controllability. Most helicopters and small planes don’t have the deicing equipment to fly in such conditions, and, in extreme cases, freezing rain can make the largest, most sophisticated planes impossible to fly. Ice from freezing rain can also clog critical sensors, feeding pilots the wrong information about airspeed, lift and drag and making it difficult to maintain a constant altitude. WAOW: What's the Difference Between Freezing Rain and Sleet? Wunderground: Sleet and Freezing rain: What's the Difference? Peters, Rosemary. "Freezing Rain Facts." Sciencing, https://sciencing.com/freezing-rain-19674.html. 25 April 2017.